If you are working man or woman in Germany, Japan. Great Britain, the United States, Canada, or anywhere else in the world, Albert Cummings is a kindred spirit. He is a master carpenter and home builder as well as being, according to the late great B.B. King, one of the world’s best blues guitarist. I got so see him this past Friday (February 17, 2017) at Stage One in Fairfield, Connecticut. It is a small cozy venue without a bad seat in the house and it was a perfect setting for his style and music. Albert comes across as an everyday person. Dressed in an untucked maroon long sleeve shirt and jeans and wearing a grey baseball cat, Albert is your average working guy…..until he strikes a chord on his guitar and begins to belt out tunes with his distinctive voice. 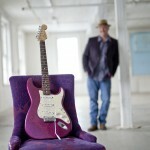 He started playing the electric blues guitar while he was in college…drawn to it by the music of Stevie Ray Vaughan. And in 2003, he put out his first solo album, From the Heart, with no less than SRV’s group, Double Trouble, as his studio band and producers. In 2006, he recorded, Workin’ Man Blues, on the album Working Man. It is a remake of song written by Merle Haggard that fit’s Albert persona and will forever be the way that I think of him. On stage, Albert smiles and grins a lot. It is obvious that he loves playing the blues. And once he got started, it was rapid fire rockin blues for two hours. Backed by a tight bass guitarist and drummer, he covered songs for his latest release, Someone Like You, on Blind Pig Records (a powerhouse blues label… http://www.blindpigrecords.com/ ) as well as favorites like Cry Me A River, Hoochie Coochie, and The Blues Make Me Feel So Good from his previous albums. Afterwards he mingled with the crowd and I got him to sign my Albert Cummings baseball cap. He was as friendly in person as on stage. We chatted about the blues and he wished me the best as a blues dj and blogger and his thank you for me playing his tunes on my stream was just so damn genuine. Over the next two months, Albert will be playing venues all over the northeastern United States, the mid west, and the South. Check out his tour dates at http://albertcummings.com/tour-dates/ and if he comes your way, go spend an evening listening to the rockin blues of the Workin’ Man Albert Cummings.